Cards can be powerful additions to the user experience with Alexa. These graphical cards are meant to enhance the voice experience, giving developers a chance to deliver value-add content the user may need to see, while still being relevant to the voice conversation. There are many form factors to consider in how cards are displayed. Users view home cards in the Amazon Alexa app for iOS/Android/Fire OS and on screen when interacting with Alexa on Fire TV. 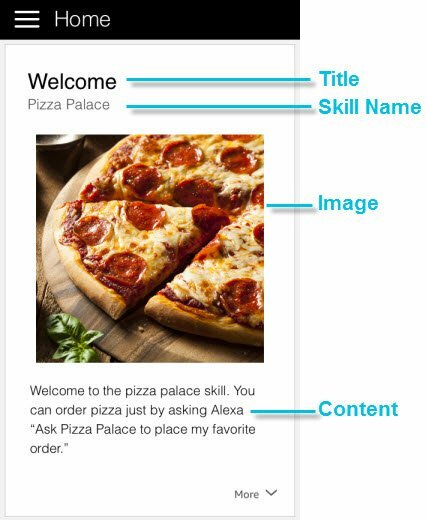 On Alexa-enabled devices with a screen, users view cards that either follow a default format, if the skill developer has not specifically designed the skill for the screen, or cards that have been formatted with display templates designed specifically for screen display. This guide provides design best practices for both simple and standard cards. For details about how you include a card in your skill's response, see Including a Card in Your Skill's Response. 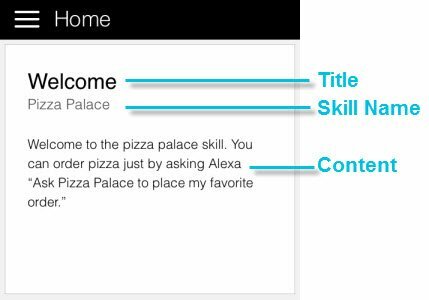 For creating display templates for use on Alexa-enabled devices with a screen, see Display Interface Reference. When to Include Cards, and How Often? A simple card displays plain text. You provide the text for the card title and content. 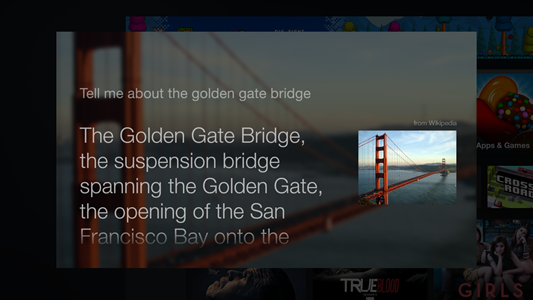 A standard card displays plain text and an image. In addition to the card title and content, you provide the URL for the image. 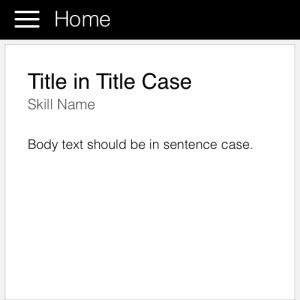 If display templates have not been explicitly included in the skill, and the skill is used with an Alexa-enabled device with a screen, any cards used in the skill are rendered using BodyTemplate1, which provides a similar look to the Alexa app. 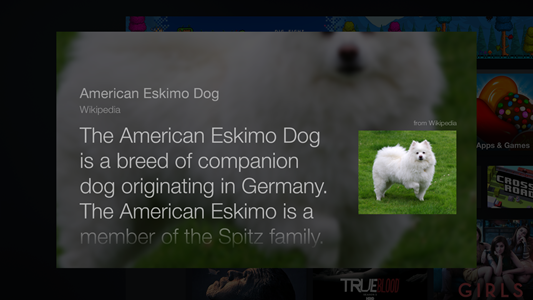 Note: When displayed on Fire TV, standard cards use the same image in both the background and foreground. The timing and frequency of pushing cards is important. Limit the number of cards: Too many will take the user out of the voice experience. Avoid pushing cards with every response, unless it is absolutely necessary. Don't make it a necessary step: Avoid making the user leave the voice experience to complete a task or view something on the Alexa app in order to continue. With Echo Show and Echo Spot, voice should remain the primary form of interaction, and as much as possible, the user should be able to navigate through the skill strictly by voice. Important: One exception to these rules: for skills with account linking, if the user's request requires authentication and the request does not include an access token , your skill's response should include the LinkAccount card every time until the user logs in and links the accounts. Note that this does not apply if this request does not require authentication, even for skills with account linking. 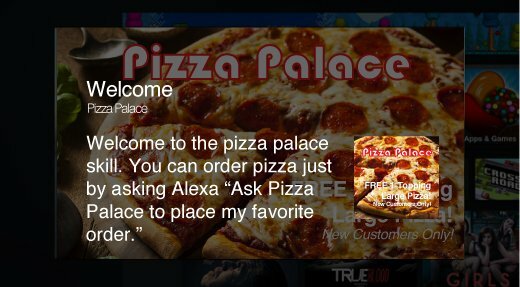 User: Alexa, ask Pizza Palace what did I order last? 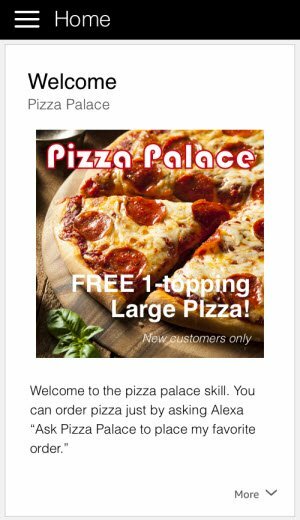 Pizza Palace: I've sent a card to the Alexa app with the information on your last order. You can take a look and come back. Cards can support the voice experience by sharing additional information or details of a voice event. Highlight the Right Details: Help a user evaluate a product where only the product name or a very brief description was shared via voice. For example, share reviews, images, ratings numbers, dimensions, and so on for a product. Add Context: Provide extra context for the voice interaction. For example, a request to make a purchase with a gift card could send a card indicating the gift card balance if it is below a threshold. 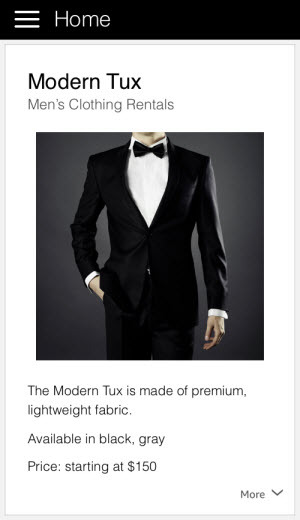 User: Tell me more about your Modern Tux. Alexa: Our Modern Tux is made of premium, lightweight fabric and is available in black and gray. Rental prices start at $150. 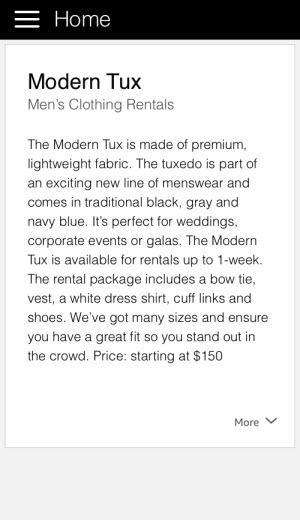 Would you like to learn more about renting this tuxedo? Alexa: Thank you for making a purchase with us. I've noticed that your gift card balance is now below $5. Use cards as individual experiences: Don't depend on the card before or after using the skill since the user might not be able to access it. Don't expect users to save information on the cards: Cards can't be saved. Don't expect users to save the data on the cards or refer to it in the future. For instance, while details about a transaction are useful as a card, the card can't serve as a transaction receipt since the user can't save it. In addition, users can't search for old cards. Cards can be a great way to get a lost user back on track, or enable self-service to show users what they can do. Provide guidance: Give enough detail for the user to move forward when lost – without going overboard. Suggest sample utterances when they need help: Share sample utterances when AMAZON.HelpIntent is triggered. Keep the timing and context in mind: Don't offer utterances that can't be used in the context of the current situation. For example, don't suggest a checkout utterance when there aren't any items in the user's cart. User: How can I use this? 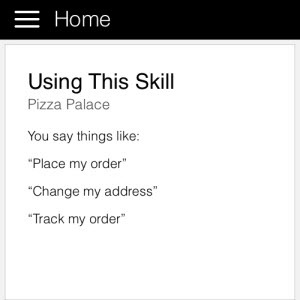 Pizza Palace: Some things you can do with Pizza Palace include: place my order, change my address, or track my order. Think of cards like slides in a powerful slide presentation. Keep it short, informative and clear: Structure text for cards in brief, informative sentences or lines of text. Avoid unstructured product details. Don't rely on large blocks of text: Cards are not meant for long blocks of text. Keep details to a minimum so a users can evaluate the card at a quick glance. Sometimes you need a break: Use line breaks to help format individual lines of addresses, product details or information. However, don't double line break when separating parts of a street address. Links can't be clicked; avoid them or provide clear direction: Since URLs in cards are not clickable links, don't just show URLs to direct users to other sites. Instead, provide instructions to direct the user. For example, have Alexa say something like "go to the settings section of (the website name)". There is a right way and a wrong way to approach text casing on cards. Make it easy to read: Use sentence case for body text and title case for headlines to make it easier to read. 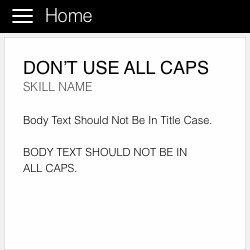 Reserve it for the titles: To improve readability, don't use title case for the body text. Don't shout: Avoid using all caps in headlines or body copy. Do a grammar check: Make sure your text is readable and grammatically correct. 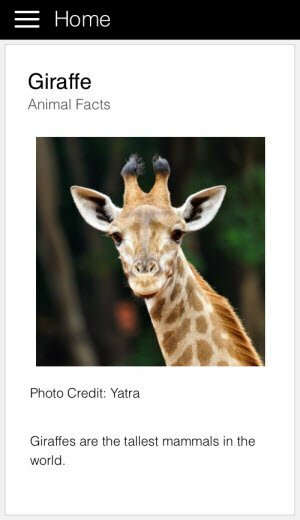 Image use on cards is limited to a single image on a card. Images are shown at a variety of sizes across the Alexa-enabled device spectrum. It is therefore important to ensure details are limited and images are provided at sizes optimized for smaller and larger screens. Use simple high-quality images: Choose images with simple shapes and details that can be seen from several feet away to several inches away. Think: Fire TV vs mobile. Save them at 72dpi. Use both small and large images: Small images are 720px x 480px. Large images are 1200px x 800px. If you don't supply a large image, Fire TV will default to the smaller image and it will appear blurry or distorted. Don't use text on images: Err on the side of no text on imagery to ensure the best card experience but if you must make sure it's easy to read at smaller sizes. Give credit: Include any image credit/reference as text on the Alexa card. (Do not place them on the image). Don't use images from the Internet or images you do not have express written license to use. Fire TV introduces variability in the card experience due to the size of the viewing screen and its inherent design elements. Images appear differently: The images you use on cards will appear in the background of Fire TV cards in addition to the card in the foreground. Prioritize important information: Put must-read information at the top of the card as the user may not scroll through the full text. Test your cards using Fire TV: Ensure you understand the constraints and optimize cards with the audience for Fire TV's in mind. 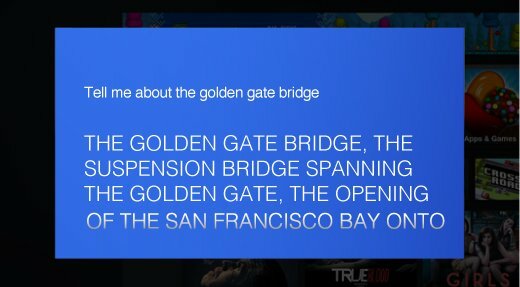 Don't use long passages of text: It is annoying for users to have to scroll through lots of text on Fire TV. Remember, there is no history: Use cards as individual experiences and don't depend on the card before or after since the user might not be able to easily access it. Think of the card as less of a receipt for a transaction and more of a part of the overall experience. Create unique experiences that build on the overall conversation. Optimize the card for reading: Don't place transcripts of user's Alexa conversations on the card. Provide quick, easy-to-understand copy. Make it delightful: Add moments of surprise and delight into the card. 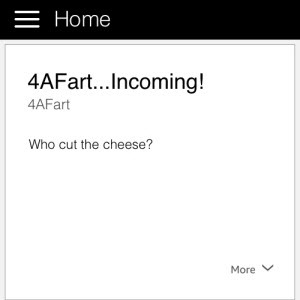 For example, the 4AFart skill has a funny phrase accompany the card when the audio is played. Keep it visually interesting: Where relevant, use different images based on what the user has heard, or the text represented on the card. Avoid using the same image on every card, if possible. The right details matter: Bring the experience to life by adding images and supporting information. For example, if the user orders tulips, show them a picture of a tulip arrangement.